Ali Naschke-Messing is a native Californian, currently living in San Francisco. Based in New York City for seven years, she returned to California in 2005 to attend a residency at the Mendocino Art Center and ultimately to pursue graduate studies at the California College of the Arts where she completed her MFA in 2007. Naschke-Messing is primarily a site-responsive installation artist. She creates spatially quiet moments and reminds us to look carefully at what surrounds us. She explores architecture with thread and light to highlight unseen forms and engage with ulterior dimensions. She enjoys the freedom of working across disciplines, using various media and materials. Naschke-Messing has created several large outdoor installations, and used sound, video, and performance over the course of her career. She is interested in participation: she has included other people’s stories into her projects, and employed viewers’ bodies in the completion of a story. She shows locally and nationally, and her work is in various private collections. Recent venues include The Laguna Art Museum, Laguna Beach; The Atlantic Center for the Arts, New Smyrna Beach; and in San Francisco: Triple Base Gallery, SOMArts Cultural Center, New Langton Arts, Braunstein/Quay Gallery, Intersection for the Arts, and The Exploratorium. 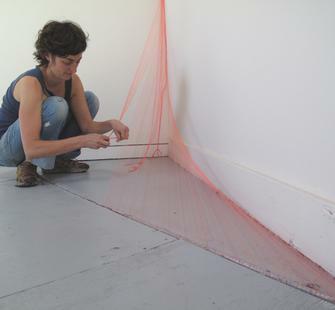 Upcoming shows in 2010 include Depth of Surface at the San Francisco State Fine Arts Gallery and By a Thread at the San Jose Institute for Contemporary Art. Her work has been featured in issues of Famous and Color & Color.